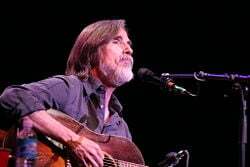 Clyde Jackson Browne (October 9, 1948 - ) is an American rock singer-songwriter and musician, whose introspective lyrics made him the leading Southern California "confessional" singer-songwriter of the late 1960s and early 70s. Browne's 1978 album, Running on Empty, was his best-selling LP and gained him several awards. Browne joined the Nitty Gritty Dirt Band in Los Angeles in 1966 and was a staff writer at the Nina Music branch of Elektra Records in the late 60s. His solo recording debut in 1972 was a self-titled album, featuring the successful singles "Doctor My Eyes" and "Rock Me on the Water." His second album, "For Everyman," included Browne's version of "Take It Easy," the Eagles hit he had co-written with Glenn Frey. "Late for the Sky," released in 1974, was his first certified gold album. Browne produced several successful records for other artists, including Warren Zevon's self-titled 1976 album and Zevon's Excitable Boy (1977). Browne also was co-founder of Musicians United for Safe Energy (MUSE) in 1979, and the Amnesty International Conspiracy of Hope concert series in 1986. Noted for his political activism, he has recently been visible the campaigns of Democratic presidential candidates. Browne was inducted into the Rock and Roll Hall of Fame in 2004. Browne was born in Heidelberg, Germany, where his father was an American serviceman. Jackson's mother, Beatrice Amanda (née Dahl), was a Minnesota native of Norwegian ancestry. He moved with his family to the Highland Park district of Los Angeles, California at the age of three, and in his teens began singing folk music at local venues. After attending Sunny Hills High School in Fullerton, he joined the Nitty Gritty Dirt Band in 1966. A precociously gifted songwriter, by the beginning of 1967 Browne signed a publishing contract with Nina Music, and his songs were performed by Joan Baez, Tom Rush, the Eagles, Linda Ronstadt, Bonnie Raitt, the Byrds, and Steve Noonan, among others. After moving to Greenwich Village, New York, Browne was briefly in Tim Buckley's back-up band. He also worked on Nico's Chelsea Girl album, both by playing guitar and penning the classic song "These Days," which reach number eight in 1972. After leaving New York City, Browne formed a folk band with Ned Doheny and Jack Wilce. He spent the winters of 1967 and 1968 in Greenwich Village, and by 1969, he had established a reputation as a talented songwriter. 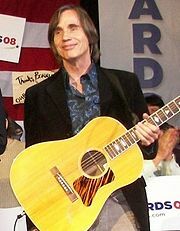 In 1971, Browne signed with Asylum Records and released Jackson Browne (1972), which included the piano-driven "Doctor My Eyes," a Top-10 hit in the U.S. singles chart. "Rock Me on the Water," from the same album, also gained considerable radio airplay, while "Jamaica Say You Will" and "Song for Adam" helped establish Browne's reputation as a versatile and original writer with an introspective, often romantic flair. During this period, he also toured with fellow California artist Linda Ronstadt. Browne's next album, For Everyman (1973) was somewhat less successful, reaching number 34 on the pop album chart. The upbeat "Take It Easy," co-written with The Eagles' Glenn Frey, had already been a big hit for that group, while "These Days" (written by Browne when he was 16 and first recorded by Nico in 1967) captured the essence of Browne's youthful angst. The title track was the first of Browne's musical study of soul-searching and despair set against the backdrop of a decaying society. The slide guitar work of David Lindley is featured on several of Jackson Browne's signature songs. Late for the Sky (1974) consolidated Browne's following, including the heartbreaking title song, "For a Dancer" and the apocalyptic "Before the Deluge." The arrangements featured the evocative violin and slide guitar of fellow Los Angeles musician David Lindley, Jai Winding on piano, and the harmonies of Doug Haywood. The title track was featured in Martin Scorsese's film Taxi Driver. Around this time, Browne began his fractious professional relationship with singer/songwriter Warren Zevon, mentoring Zevon's first two Asylum albums through the studio as a producer, after convincing Asylum head David Geffen into giving Zevon a recording contract. Browne's next album, The Pretender, was released in 1976, after the suicide of his first wife, Phyllis Major. It featured the production of Jon Landau and a mixture of styles, ranging from the Mariachi-inspired peppiness of "Linda Paloma" to the country-driven "Your Bright Baby Blues" and the near-hopeless surrender of "Sleep's Dark and Silent Gate." The title track "The Pretender" is a vivid account of romanticism losing the battle with the realities of day-to-day life. "Here Come Those Tears Again" was co-written with Nancy Farnsworth, the mother of Browne's wife, after the untimely death of her daughter. By this time, Browne's work had gained a reputation for compelling melodies, honest and insightful lyrics, and a flair for composition rarely seen in the world of rock and roll. Browne began recording his next LP while on tour, and Running on Empty (1977) became his biggest commercial success. Breaking the usual conventions for a live album, he used all new material and combined live concert performances with recordings made on buses, in hotel rooms, and backstage, creating the audio equivalent of a road movie. The title track, "Running on Empty," chronicling the life of the 60s generation, became a major hit. Other songs from the album included "The Road" (written and recorded in 1972 by Danny O'Keefe), "Rosie," and "The Load-Out/Stay," Browne's affectionate and knowing send-off to his concert audiences and roadies. Shortly after the Three Mile Island nuclear accident in March 1979, Browne joined with several musician friends to found the anti-nuclear organization, Musicians United for Safe Energy (MUSE). This activism, however, did not hurt his commercial success, as his next album, Hold Out (1980), was his only number-one record on the U.S. pop albums chart. The following year, he released the single "Somebody's Baby" from the Fast Times at Ridgemont High soundtrack, which became his biggest hit, peaking at number seven on the Billboard Hot 100. The 1983 Lawyers in Love followed, signaling a discernible change from the personal to the political in his lyrics. Lives in the Balance (1986) was an explicit condemnation of Reaganism and U.S. policy in Central America. Flavored with new instrumental textures, it was a success with Browne fans, though not with mainstream audiences. 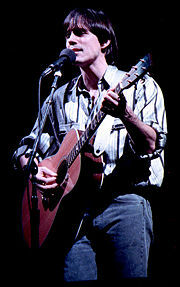 Throughout the 80s, Browne performed at benefit concerts for causes including Farm Aid, Amnesty International, Nicaragua under the Sandinistas, and the left-wing Christic Institute. The album, World in Motion, released in 1989, continued in a politically-oriented and polarizing vein. After a professional hiatus of several years, Browne returned with I'm Alive, a critically acclaimed album with a more personal perspective. In 1995, he performed in The Wizard of Oz in Concert: Dreams Come True a musical performance of the popular story at Lincoln Center to benefit the Children's Defense Fund. Browne's Looking East (1996) was released soon after, but was not as successful commercially. The Naked Ride Home was released in 2002. Solo Acoustic, Vol. 1, was released in 2005 on Inside Recordings. The album consists of live recordings of 11 previously-released tracks plus "The Birds of St. Marks," a song that does not appear on any of Browne's studio albums. In 2008, Browne's released the live album, Solo Acoustic, Vol. 2, along with a studio album, "Time The Conqueror," his first studio album since leaving longtime-label Elektra Records in 2003. Jackson has two sons, Ethan Zane Browne, born November 2, 1973 to his first wife, Phyllis Major, and Ryan Daniel Browne, born January 28, 1982 to his second wife, Lynne Sweeney. Although Jackson has not remarried since his divorce from Lynn in the mid 1980s, he has been with longtime partner Dianna Cohen for more than a decade. For Running on Empty, Browne won the Second Annual Rock Radio Awards for Favorite Male Singer, Favorite Singer/Songwriter, and Favorite Album in 1978. He also won the John Steinbeck Award in 2002). In 2003, three of Browne's albums—For Everyman, Late for the Sky, and The Pretender—had been selected by Rolling Stone magazine among its choices for the 500 best albums of all time. He also won the Founders Award from the American Society of Composers, Authors, and Publishers and an honorary doctorate from Occidental College in 2004. In the same year, Browne was inducted into the Rock and Roll Hall of Fame. For "promoting peace and justice through his music and his unrelenting support for that which promotes nonviolent solutions to problems both nationally and internationally," Browne received the Courage of Conscience Awards on June 21, 2007, from The Peace Abbey in Sherborn, Massachusetts. In 2008, he contributed to an album called Songs for Tibet, to underline the human rights situation in Tibet. During the 2008 U.S. presidential campaign, Browne sued John McCain and the Republican Party for using his 1977 hit, Running on Empty, in an ad against Barack Obama without his permission. Bego, Mark. Jackson Browne: His Life and Music. New York: Citadel, 2005. ISBN 978-0806526423. Browne, Jackson. 5 John Lennon. San Francisco, CA: Straight Arrow Publishers, 1967. Decurtis, Anthony. 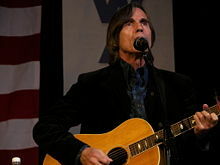 Jackson Browne—The People Against Vietnam are Against this War. All the Same People are Awake. San Francisco, CA: Straight Arrow Publishers, 1967. Hoskyns, Barney. Hotel California: The True-Life Adventures of Crosby, Stills, Nash, Young, Mitchell, Taylor, Browne, Ronstadt, Geffen, the Eagles, and Their Many Friends. Hoboken, NJ: John Wiley, 2006. ISBN 978-0471732730. Wiseman, Rich. Jackson Browne, The Story of a Hold Out. Garden City, NY: Doubleday, 1982. ISBN 978-0385178303. All links retrieved March 12, 2018. This page was last modified on 12 March 2018, at 19:25.